You’ve finally made the decision to get your SCUBA certification so you can dive when you’re on your next vacation. The first step to making your dream come true is to understand the certification process. First of all, there are two main certification schools: PADI and SSI. PADI (Professional Association of Diving Instructors) and SSI (Scuba Schools International) are both governed by the World Recreational Scuba Training Council (WRSTC). The World Recreational Scuba Training Council dictates the standards for training, but each program is unique in its own way. There are more certification schools out there other than PADI and SSI, but those are the two big ones. Both certifications will be recognized wherever you go in the world, so be sure to choose your course wisely! Most folks start off with a very basic Open Water Diver Certification, so we’ll start there. Please keep in mind that each school will have different names for similar certifications. For instance, the PADI Open Water certification is the same as the SSI Advanced Adventurer certification (not the SSI Advanced Open Water certification like you would think). So just be aware of the naming and choose wisely. Both SSI and PADI will offer students the ability to start the practical portion of the lessons ONLINE, which is very convenient. There will come a time in your certification process where you are required to get into the water. Never fear! Your PADI or SSI program will supply you with a regulator, a weight belt, a dive computer or dive planner, SCUBA tank, wetsuit or dry suit, and weight system. While your certification company will supply you with the technical gear as part of the training, you will want to check with them to confirm what equipment they provide. Depending on where the training is being held, the equipment will vary quite a bit. Part of your certification will be learning about the aforementioned pieces of technical equipment, so don’t be intimidated if you don’t know what a regulator is! 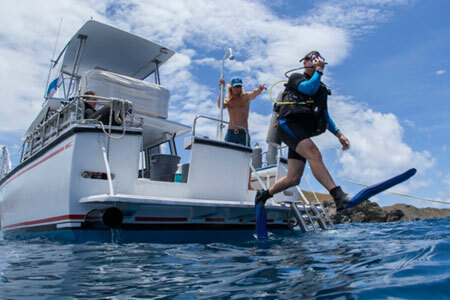 The most important thing to bring to your first diving lesson is an adventurous attitude. You are embarking on a journey that very few get to enjoy in their lifetimes! Getting your certification is just the start – most people find themselves quite addicted after the first guided dive outside of the certification process. Most dive touring companies will have everything you need, but you will likely pay fees for renting gear and potentially paying a guide to show you around their local underwater playground(s). Each certification organization will supply different gear at your first in-person certification lesson. Call or email them to ask what you should bring! Each certification organization (PADI, SSI or many others) will all call their courses different names. Make sure you read each course description very carefully to make sure you are getting the correct certification for your preference. It’s okay if you don’t know much about the technical equipment. Part of your training will include how to purchase, use and maintain your own gear (regulators, SCUBA tanks, weight belts, dive computers and more are all part of it). Bring an adventurous attitude! Don’t be scared – you are with professionals who won’t let anything bad happen to you. Trust them, and trust yourself! Diving is a sport that is laden with potential risks – make sure you listen carefully at your certification lessons, and take everything your instructor says very seriously. Bring sunblock, sunglasses, a swimsuit, your own dive goggles, fins, snorkel and wetsuit (if you have one/need one at the location you are getting trained at). Have fun at your first lesson, and we hope to see you at one of our many guided dive trips in the future!